We are levelling the area with soil on top of customers flat roof extension. He ultimately lost the garden due to the extension of the house. Here you can see us laying the turf on the flat roof. We only have two rows of turf left to put down until the job is finished. This is the finished product of the turfing for the flat roof extension. This is a job which I did at home. Firstly we had to remove the lawn and then lay down a membrane to help retain the weeds. We made raised beds for our vegetables. 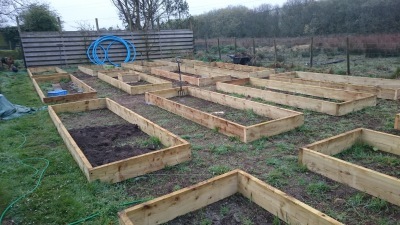 The raised beds were made out of 9x2 pieces of timber. This is the finished jobs. As you can see, we have covered the pathways in wood-chip to cover the membrane previously laid down.